For CD's & DVD's by Pundit Munelal Maharaj & Naveeta Maharaj visit this link http://www.hindisongstt.com/song_listing.php?catId=79 where you can make your purchase today. To hear snippets of songs from the latest Cd by Pundit Munelal and Naveeta Maharaj (Sundar Naam) click on link http://www.hindisongstt.com/artist_detail.php?id=292 where you can also read his Biography. The subject of death has long been shrouded in darkness, mystery, superstition, fear, misinformation and ignorance. Although we recognise its inevitability, the picture painted of death as the "grim reaper" instills apprehension in the hearts of many and it is with great reluctance that we engage in any discussion on death and what transpires after someone dies. At a basic level, it has resulted in a total lack of familiarity with most fundamental rites, rituals and customs associated with death, disposal of the body and ceremonies, which form part of the antyeshti sanskaar (final rites) in the Hindu tradition. At a higher level, there is a near total ignorance of the various Hindu philosophies regarding the nature of human existence, the relationships between the human body and the soul as well as the individual soul (jeevaatma) and the Universal Consciousness (paramaatma). Through "Death and the Soul's Journey", we have attempted in as clear and concise manner as possible, to deal with this topic at both the basic, practical level and the esoteric or philosophical level. The reader is provided with detailed instructions regarding what should be done by members of a family in which death occurs, including funeral preparations and requirements for the post-disposal rites such as the ashti sanchaya, dasgaatra and shraaddha. 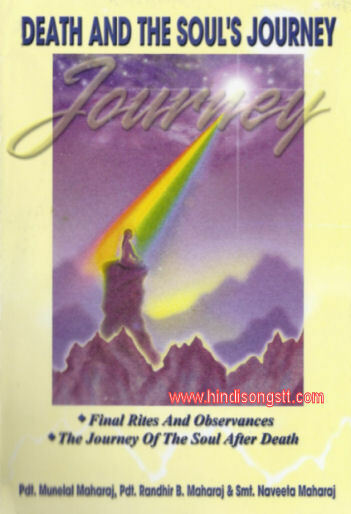 We have tried to eradicate superstitions, clarify common misconceptions and to provide information regarding the soul's journey after death, its judgement, its rewards and/or punishment (based on the law of karma), the nature of heaven and hell and the soul's journey subsequent rebirth. The publication was not possible without profound thought and introspection as well as a great deal of research. 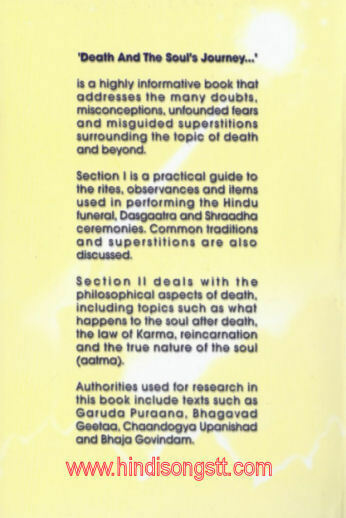 There are extensive quotations from orthodox Hindu Scriptures such as the Garuda Puraana, Shreemad Bhagavad Geetaa and Chaandogya Upanishad and although we are quite aware that there are some who question the authenticity of the Garuda Puraana as a scripture, we believe it would be presumptuous of us to assume the capacity or the authority to make any pronouncement on such a profound issue. While in some instances, we have expressed personal views, by and large our goal is to bring to the reader's attention the relevant scriptural directives on the relevant topics. For the eager seeker of knowledge we have included references from other religions and philosophical thinkers. With respect to the rites and rituals, we have remained faithful to those outlined in the 1999 publication of the Sanatan Dharma Mahaa Sabha entitled "Saral Antyeshti Sanskaar Vidhi". We are delighted to present the text Death and the Soul's Journey, with the hope that it would help to provide answers to the many questions you may have and with the prayer that it would lead to a greater degree of understanding and appreciation of this aspect of our lives, which we should all learn to face calmly, rather than fear. "Slight is my intellect, but profound my subject; conscious I am that I have neither skill nor capacity. Beggarly is my wit but lofty and exalted are my goals." We humbly seek your forgiveness for any shortcomings in this offering. Om Tat Sat. This excerpt was taken from the book Death And The Soul's Journey - written by Pdt. Munelal Maharaj and Pdt. Randhir B. Maharaj and Smt. Naveeta Maharaj.